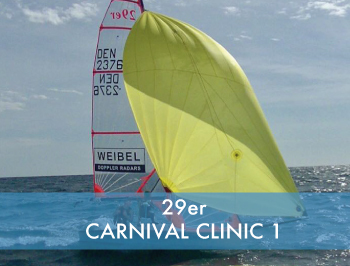 29er – Carnival Clinic 1 | Dinghycoach 17 Feb Clinic day 1 18 Feb Clinic day 2 19 Feb Clinic day 3 20 Feb Clinic day 4 21 Feb Clinic day 5 22 Feb Clinic day 6/ Departure Daily schedule 09.30h Physical session 10.00h Briefing 11.30h Sailing 15.30h Debriefing Pricing Price to be confirmed. Pricing depends on how many teams join the clinic. If you are interested please contact Diego lanzarote@dinghycoach.com and inquire for prices and interest. Sailors get a choice to book the clinic including accommodation to stay at our hotel or excluding accommodation and arrange their accommodation in a villa through us or elsewhere by yourself. Since 205 we also offer 29er clinics in Lanzarote! Over the years we have welcomed teams from over 15 different countries to do their 29er winter training on our beautiful island! During our 6-day intensive training camps we will get quality hours on the water covering all aspects of racing. Pricing depends on how many teams join the clinic. If you are interested please contact Diego lanzarote@dinghycoach.com and inquire for prices and interest. In case you would like to book a villa through us, please contact Diego at lanzarote@dinghycoach.com. 1 teammember needs to register and indicate name of the crew. Prices stated are per person. We have sails available for rental but this needs to be confirmed by Diego in advance.